It is Hydrangea Palooza, Betsy is cutting hundreds of stems a day right now and they look really nice, both white and the brilliant Nikko blue. Betsy’s beautiful bouquets. Plenty of yellow Asiatic (non-fragrant) Lilies. Campanula (Canterbury Bells) in blues and pinks. 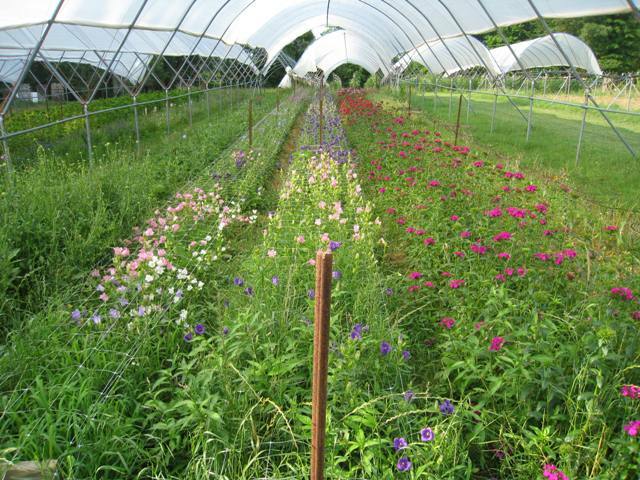 A bit more Safflower and lots of late Dianthus, intense reds and purple/pinks. OK so I know we are all shaking with the excitement of real tomatoes and there will be a small supply of our new early red Ultrasweet, some Cherokee Purples and the great early season yellow/orange variety, Orange Blossom. Still some Summer Crisp lettuce, despite the groundhogs best efforts, that crispy sweet cross between Romaine and Leaf lettuces that is hot weather tolerant, in green dappled with Red and intense Red. The last of the Escarole. Also the traditional round red and tall white (Sugarloaf) Radicchio’s. The last of the Beets; Red, Golden and the striped Chioggia it has been one of our best crops ever. More Cucumbers. A little more Lacinato or Dinosaur Kale. Leeks are back, very nice long shafts. Probably some Basil too.